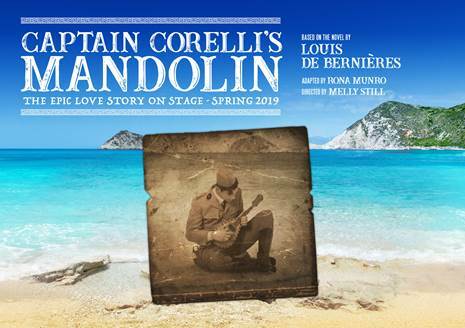 The first major stage production of Captain CorellI’s Mandolin, based on the best-selling novel by Louis de Bernières will tour the UK with a stop in Glasgow, 25 years after the book was first published. Directed by Olivier and Tony Award nominee Melly Still and adapted by Evening Standard Award winner and Golden Globe and BAFTA Award nominee Rona Munro, the play will run at Theatre Royal Glasgow from Tuesday 25 - Saturday 29 June 2019. The production will have set and costume designs by Mayou Trikerioti, lighting design by Malcolm Rippeth, sound design by Jon Nicholls, projection design by Dom Baker for OD Vision and music composed by Harry Blake.